The reason I became a pescatarian is twofold: I self diagnosed myself to be allergic to meat but because I love seafood, I made it an exception. It all started when I got food poisoning several times from eating beef over the course of 3 months. The experience was horrendous. Not just the pain, but the helplessness over my body made it absolute that I ate responsibly. Responsibly at first just meant no beef. But then I started researching, checking labels and looking up ingredients/chemicals. I really got into the science of food after watching Forks Over Knives and the ethics of the industry after watching Food, Inc. I must say though it's not easy to eat this way - the social aspect of going out to eat, pricey groceries, and the time it takes to cook something after a long day instead of grabbing a taco from the cart outside my apartment. And it's not quite as simple as cutting something out of your diet and you're good to go. I have to really make sure I get enough nutrition and protein in my system. A few months ago I went for a check up and my doctor said my body mass index was low. This was shocking to me because I thought I was eating healthy. To ensure that I get all my daily values, I make smoothies everyday either for breakfast or pre/post workouts. 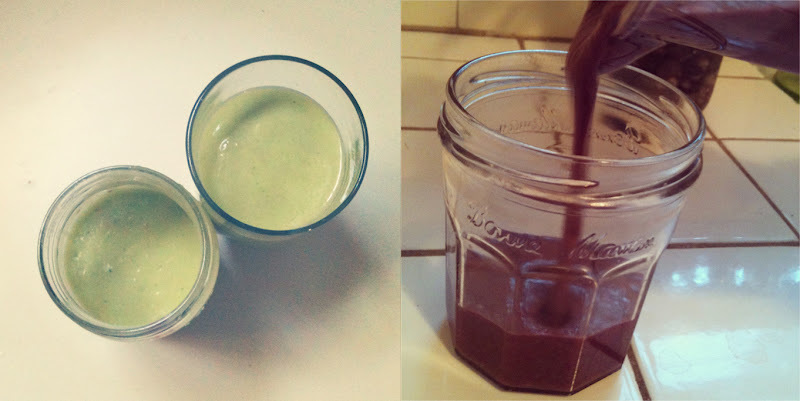 In every smoothie I add flax seed, hemp protein, and liquid chlorophyll. Flax seed is packed with lignans and omega-3s, hemp protein has lots of fiber and protein, and liquid chlorophyll is detoxifying among other miraculous things. Ocassionally (if I remember) I crush this food-based multivitamin and add it to my smoothie. My smoothie recipe trove is Green Lemonade. I am no health expert. Information is so accessible these days so take it as you will. This has been my journey and I'm still learning, struggling, and trying. I always say that I have an iron stomach. Besides melons (allergies), I can eat almost anything that I find delicious without any repercussions for my digestive tract. I'm pretty lucky because I can wolf down Mexican at 2 AM or spicy kimchi jjigae without any stomach pains. I try not to abuse my superpower more than a couple times a week. In general, I eat pretty healthily, and my biggest challenge is eating healthily when I am out socially. I shop at a regular local supermarket because frankly, organic foods, etc. are not accessible to me in geography or budget. My meals are pretty pitiful because I have cut out a lot of the things I used to cook - omelettes, chicken, etc. Dinner is tricky though. Either I have a date with my parents, sister, friend, or BDF. When I eat with my parents, I eat healthy Korean food. When I eat with my sister, usually she forces me to eat healthily. When I eat with BDF or friends, I usually am too tempted at the restaurant to choose salad when there are so many other delicious options. Right now, it's tough to always eat a healthy dinner because I haven't been cooking at home. ICE CREAM: Yogurt parfaits. You can definitely make it at home with lowfat or nonfat yogurt + fruit + granola or greek yogurt + honey. 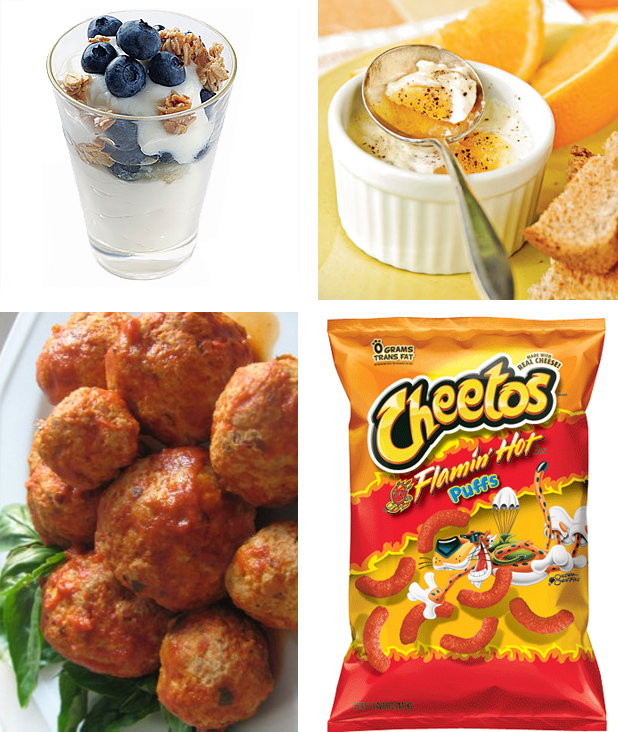 You don't need a recipe, but here's one in case you reallly don't get it. SAVORY: Baked eggs. They're not that great for you because of the addition of milk or cream, but it's not too bad either. This recipe is similar to the one I use. PASTA: Meatballs and pasta sauce. I keep turkey meatballs in the freezer and a jar of marinara sauce in the fridge --- both from Trader Joe's. Image source. Monica, those smoothies look so appetizing! And Junette, I laughed out loud at your Cheerios obsession. My weakness in high school was Hot Cheetos Fries plus nacho cheese... Heart attack food for the soul. I am a smoothie addict! These look like some that I will have to try out for sure asap! Thank you for the ideas!